Something is amiss in the neighboring kingdoms of Etceteria and Miscellania, and King Vargas has declared war! Can you solve the problem and prevent an unnecessary war between the kingdoms? It's tough being the regent of a small island kingdom, especially when the King has declared war while you were off adventuring. Something is up in Miscellania and Etceteria, and you'd better find out what, before both kingdoms end up in Royal Trouble! 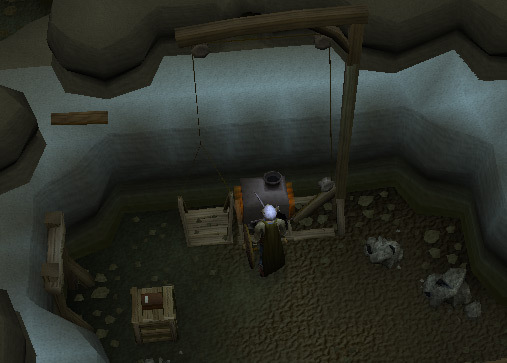 Speak to Advisor Ghrim on the second floor of Miscellania Castle. 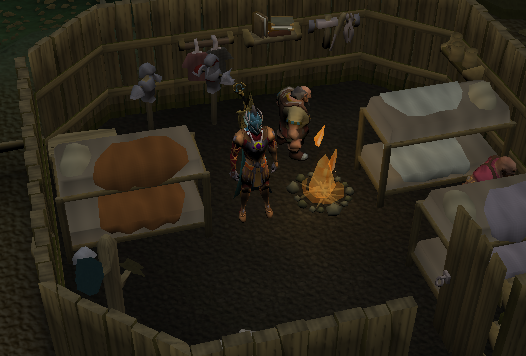 Start the quest by speaking to Advisor Ghrim on the second floor of Miscellania Castle. He will tell you to talk to Prince Brand and Princess Astrid. Talk to one of these and a cut-scene will follow that tells you the King is bored and causing a bit of trouble, war is likely to break out between Miscellania and Etceteria. One of the solutions Prince Brand thinks is a marriage between King Vargas and Queen Sigrid. Well it is up to you to solve the problem. Now head for Etceteria and talk to Queen Sigrid. She will tell you her citizens have reported items stolen. Now you need to talk to any one of three citizens. Matilda and Haming can be found near the castle itself, while Arnor can be found near the bank. The citizen will tell you that the Miscellanian Soldiers are to blame for the theft of the items. Report this to the Queen and she will order you to speak to King Vargas, after all you are the Regent and should solve this. 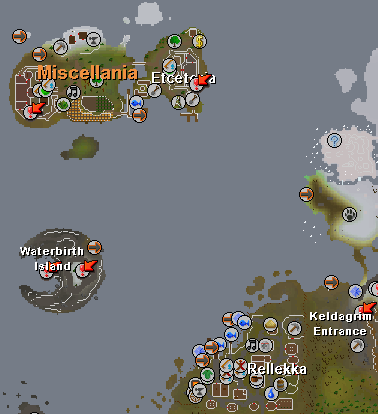 Speak with King Vargas and he will tell you about missing items in Miscellania and orders you to talk to Leif, Magnus and Frodi (you can talk to anyone gathering resources for you). Leif is cutting the maples, Frodi is the fisherman at the docks and Magnus is the one mining coal at the north side of Miscellania. After you have done this speak first with Queen Sigrid and then with King Vargas. King Vargas tells you to speak to Advisor Ghrim again, as he is probably the one who knows about strange elements stealing things. Do so and he will tell you the one most likely to know about strange arrivals is the Sailor on the docks. Head there and he will tell you about the dungeons. "Dungeon" is not the right word for it as the dungeons are being excavated to house new arrivals. A whole new village, complete with pub and general store. Now go back to King Vargas, speak with him and ask permission to enter the dungeon. He will give you a Scroll that will allow you to enter. Location of the dungeon is at the south end of the castle: take the ladder down, a guard will stop you but you have your scroll with you so you can enter. Talk to the store owner and he will tell you about a cave filled with water and monsters lurking about. But the dwarves would know more about this, so go to the most northern house and talk to one of the Dwarves. Any of them will tell you to talk to Donal in the pub. Go through the whole conversation, Donal will give you a mining prop that will help to safeguard you from falling rocks squeezing through a crevice. Head to the north western side of the cave, use the prop on the crevice and you enter a room. In this room you will find a few crates, an engine and a lift manual. Read the manual and you will need the following items from the crates: 3 pulley beams, 3 beams, 1 engine, 1 rope and 1 manual. First use a Pulley Beam on the Scaffold, then use a Beam with a Pulley Beam in your inventory to get a Long Pulley Beam. Next use a Beam with this to get a Longer Pulley Beam, then use this with the Scaffold to get the top beam into place. Now use the third and final Pulley Beam on the scaffold again to get the second cross member in place. Next attach a Rope onto the Pulleys, then use your last Beam on the platform to repair it. Finally, use your Engine with the engine platform and then use your five coals with the engine. 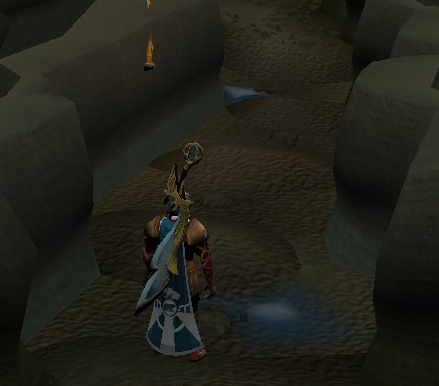 If you skipped the Coal and just brought a Pickaxe the rocks next to the lift can be mined. You now have a working lift! Take 1 rope from the crate, use the lift and pick up the plank lying there. Then enter the tunnel. Head east until your path is blocked by water: Use your rope on the left hand side of the rock above. You now have a rope swing. Walk further east until you reach some Fire Remains: search it and you will have a burnt diary in your inventory. Walk along and again you will reach water. 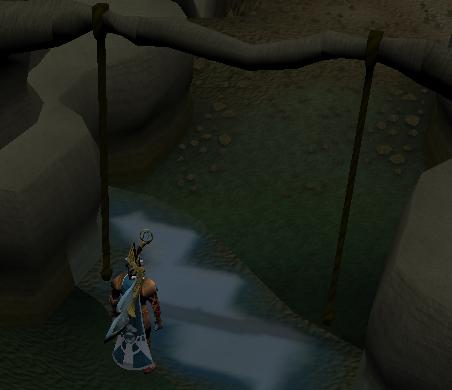 Use your plank on the rocks to traverse this obstacle. If you do not use the plank you can cross but you will get hit up to 160 Life Points per try. Search the Fire Remains at the end to find more diary pages. Follow the path and find some more Fire Remains, search this and again diary pages are added. Now head on and watch the steam vents. They can hit up to 90. Keep following the path and search through all of the Fire Remains. At the end of the cave you should see another crevice to crawl through. Read the diary, now with 5 pages added, and you can crawl through. You enter a room and a cut-scene follows with 5 youths of Rellekka trying to become adults. After this head down the tunnel and prepare for the final battle. 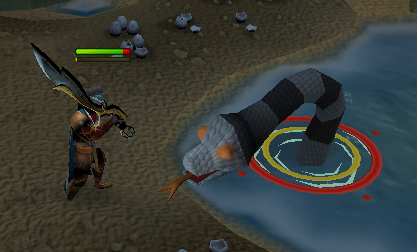 On your way there you will find different stages of the level 90 Giant Sea Snake you need to fight. Run past them until you reach a crevice, prepare and crawl through. Killing the Giant Sea Snake should be not very difficult but he will poison you and these poison hits start at 90, so use your anti poison potion. The fighting style used by the snake is a combination of Magic and Melee. 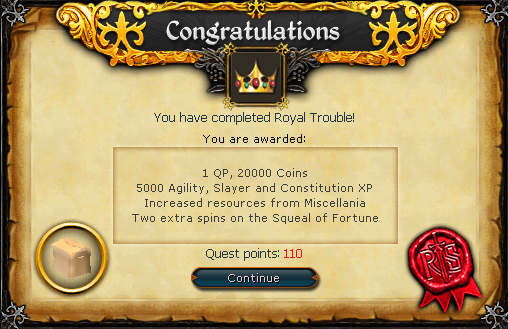 Head over there and hand him the letter, go through the conversation and: Quest complete! !